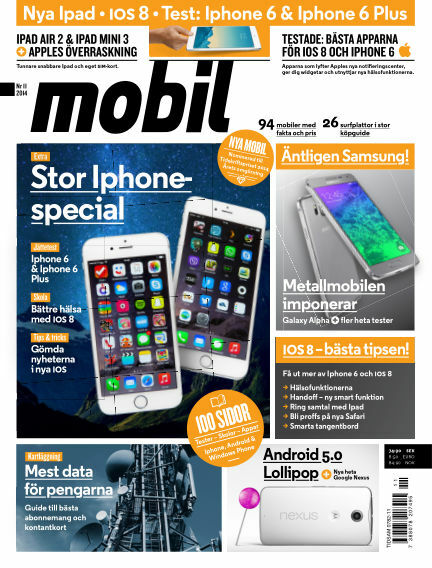 In this issue of Mobil Sverige : Stor Iphone-special med tester av Iphone 6 och 6 Plus. Test av Samsung metallmobil - Galaxy Alpha. Kartläggning av mobilabonnemang - få mest data för pengarna. Androied 5.0 Lollipop i nya heta Google Nexus. Skola - Apple Healthkit i IOS8. Massor med tips och tricks i nya IOS. With Readly you can read Mobil Sverige (issue 2014-11-04) and thousands of other magazines on your tablet and smartphone. Get access to all with just one subscription. New releases and back issues – all included.